Fashion design house established by Loris Azzaro in Paris in 1962. The Azzaro brand is arguably better known today for its fragrance line than its clothing, but Azzaro's evening wear has long been popular with celebrities. Azzaro passed away in 2003. He was succeeded by designer Vanessa Seward. The line's first fragrance, Azzaro Couture, was introduced in 1975. Other fragrances include Azzaro Pour Homme (1978), Acteur (1990), Oh La La (1993), Chrome (1996), Azzura (1999), Pure Vetiver (2000), Pure Lavender (2001), Pure Cedrat (2002), Visit for Men (2003), Visit for Women (2004). 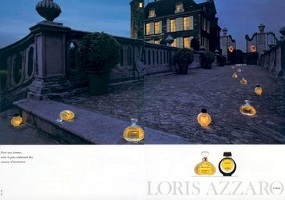 The Azzaro fragrance business is currently owned by Clarins. At selected department stores, and also readily found online at the various fragrance discounters. See all articles on Now Smell This tagged Azzaro.